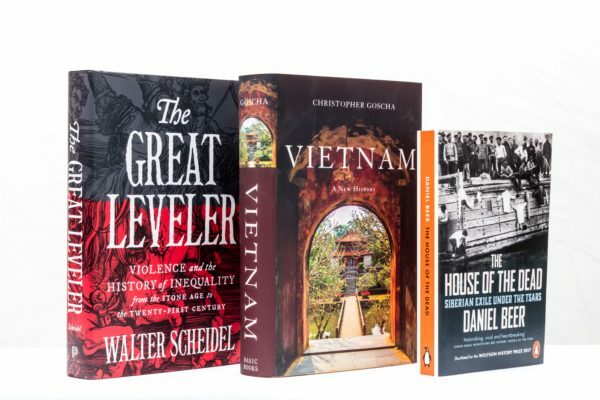 The Cundill History Prize has announced a controversial thesis on inequality, a myth-shattering history of Vietnam, and a study of Siberian exile under the Tsars as this year’s finalists. Three historians — a Briton, a Canadian and a US-based Austrian — are in contention for the US$75,000 prize, the richest in non-fiction for a single work in English. Run by Canada’s McGill University, the Cundill History Prize rewards the best history writing in English. The jury of world-class historians and authors has chosen the finalists from a longlist stretching the globe and covering pertinent issues ranging from religion to race relations. The winner will be awarded US$75,000; the two runners up receive US$10,000 each. Previous winners include Lisa Jardine and Diarmaid MacCulloch. The Great Leveler turns Thomas Piketty on its head: the Austrian-born, US-based historian Walter Scheidel uses a sweeping look at history, from the Stone Age to the 21st century, to demonstrate why inequality is so persistent — and unlikely to go away. With Vietnam: A New History, the Canadian historian Christopher Goscha has written the definitive history of an increasingly influential nation that most have only ever seen through the prism of colonialism and the Vietnam war. The British historian Daniel Beer delivers a ground-breaking new study of how the Tsars turned Siberia into a vast and brutal prison camp. The Canadian historian Margaret MacMillan, the British-American historian and author Amanda Foreman, the award-winning Oxford Professor Roy Foster, the UK historian and broadcaster Rana Mitter, and the decorated Canadian journalist and author Jeffrey Simpson are judging the Cundill History Prize in its 10th anniversary year. They chose this year’s contenders from a record 300 submissions. All three authors will attend the Cundill History Prize Gala in Montreal on November 16, where the winner will be announced.